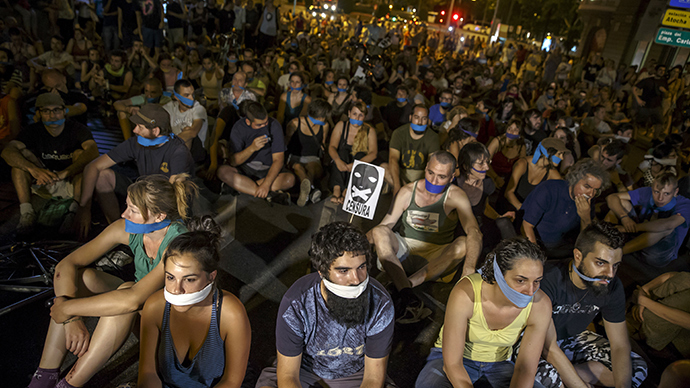 Mass protests greeted a new Spanish public security law that would make it harder for public to rally. Nicknamed the ‘gag law’, the new legislation puts restrictions on journalists reporting on police. Thousands rallied in the streets of Madrid and other cities on Tuesday evening against the Citizen Safety law coming into effect Wednesday morning. Greenpeace activists started the Tuesday protest by an action that would be difficult to pull under a new law: they placed a banner reading "Protesting is a Right" on a construction crane next to Spain's lower house of Parliament. "They want all of us to be silent, for no one to protest," Juan Sánchez, a 21-year-old student, told the Local. "With the 'gag law' brought into force, the practice of journalism will be less free," the Madrid Press Association said in a statement. The legislation was pushed through by the conservative Popular party that has the majority of the parliament as a response to mass protests over austerity measures that were frequent in the country over the last few years. According to the new law, any “serious disturbance of citizen security” in front of Congress, the Senate or regional assemblies will be considered an offence with the fine of up to €30,000 ($33,000). The wording of the legislation has been criticized by activists for being too vague. Unauthorized protests near key infrastructure, such as transportation hubs and nuclear power plants, may result in fine of up to €600,000 ($638,000). The government also believes that the images of police cracking down on protesters prevent law enforcers from doing their job and putting them at risk. The legislation allows fines for "unauthorized use of images" of police, including live and recorded video. Critics say it would stifle journalists reporting on police abuses. The police will also be able to sanction individuals who “obstruct any authority, public employee or official corporation in the exercise of administrative or judicial agreements or resolutions.” This point aims at the widespread practice of intervening to prevent home evictions. Many Spaniards have lost their homes being unable to pay rent and mortgages. The legislation was approved by the Parliament in March, even though it was met with discontent from opposition parties, human rights organizations and other public groups. “Demonstrations will be freer because they will be protected from violent elements,” Spanish newspaper El Pais quotes the claims of the ruling Popular Party (PP).